Discussion in 'Google TV General Discussion' started by Rickaren, Jan 5, 2011. Samsung said at CES that it will increase its Internet connected Smart TV line to 60% of its television offerings and 3D to 7 depth-adding sets, despite 3D TV sales last year that failed to live up to industry expectations. The company also unveiled a new feature that will come to its Smart TV line next year called 1 Foot Connect, at a Consumer Electronics Show news conference Wednesday. The 1 Foot Connect feature will allow any Samsung wireless devices -- such as a Blu-Ray player, camera, smart phone, tablet or laptop -- to automatically sync with a Samsung Smart TV or internet router as soon as the two devices are brought within 1 foot of each other, said John Revie, Samsung's senior vice president of consumer business. Once synced, the devices will be able to share content such as movies, photos and TV shows. Unlike LG and other TV makers, Samsung didn't announce at CES a line of passive 3D glasses, such as those non-battery powered specs found commonly in theaters. Instead, Samsung will release updated active-shutter 3D specs that weigh 1 ounce and fit over regular glasses. Samsung also is adding its Samsung Apps, currently only available on its Internet connected TVs, smart phones and tablets, on the majority of its Blu-Ray players next year. A new feature called Search All is a step toward Samsung competing with Google TV in content search on the TV. Search All will allow users of Samsung's new line of Smart TVs connected to the Internet and Blu-Ray players to search for content and then watch that content on their TV, whether the video is located on their Blu-Ray player, on TV on the Internet or on devices connected locally such as a smart phone or tablet. Samsung's top-of-the-line 3D models will feature a new bezel just 0.2 of an inch thick -- about the width of a pencil. The sets will feature Smart TV features and 3D. Blu-ray with built-in Wi-Fi and 3D (model BD-D6500). "The increase in available 3D content in 2011 will result in more people embracing 3D. In the meantime, people can enjoy the breadth of features offered via Samsung's Smart Blu-ray and the option to up-convert content with our 2D-to-3D conversion," said Sangchul Lee, Senior Vice President, Visual Display Business at Samsung Electronics. "As more people look to upgrade their home entertainment systems and embrace a rich, immersive 3D experience, Samsung is able to offer a wide range of options that support their needs today and into the future." All the new models epitomize Samsung's 3S concept design philosophy  symmetric, slim and slot-in  and enhance the stylish elements in any home. The units are designed as symmetric products, with all the major functions placed in the middle so that using the device is easy and convenient. The lack of moving parts in the slot-in method for loading disc media also makes the unit quieter and more efficient than those with loading trays. The models are thin and designed to complement Samsung TVs. Samsung's premium Blu-ray line-up also includes advanced Smart Blu-ray features  such as AllShare and Smart Hub, which includes Your Video, Search All and Samsung Apps  that make it even easier for people to access and share content that speak to their passions. The 2011 Blu-ray players will be on display at Samsung's booth #12006 in the Central Hall at the International Consumer Electronics Show, which will be held at the Las Vegas Convention Center (LVCC), January 6-9, 2011. Samsung also won CES 2011 Best of Innovations Design and Engineering Award for the BD-D7500 and CES 2011 Innovations Design and Engineering Awards for the BD-D7000, BD-D6700 and BD-D6500, which will be on display in the Grand Lobby at the LVCC. As the world's slimmest Blu-ray disc player, the space-saving, wall-mountable Samsung BD-D7500 packs industry-leading features into its 0.9-inch height without compromising picture quality. It has innovative 2D-to-3D conversion capabilities that enable customers to enjoy a 3D experience with pictures, movies and streaming video. Powered by Samsung's innovative video processor, the BD-D7500 is loaded with cutting-edge video picture quality enhancement algorithms and various high definition codecs. The processor's exclusive conversion engine can also up-convert content, including streaming content, to HD so customers get the best images and performance from their HDTVs. All these content sources, plus the unit's built-in Wi-Fi and Smart Blu-ray features, make for virtually limitless playback options. Additionally, the BD-D7500 connects easily to other devices without wire clutter. The DLNA-certified player features game-changing connection methods, including Samsung's patented One Foot Connection, which allows devices to also be accessed and controlled via the BD-D7500. The new Blu-ray player also comes with one HDMI input connection. Start up time on the BD-D7500 has been slashed to three seconds with Samsung's new Ultra Fast Play. This significantly reduces the start time by 80 percent when compared to 2010 models, and makes loading content on the BD-D7500 one of the fastest in the industry. Samsung's unique, minimalist design for the BD-D7000 includes a hidden slot for disc loading that pops up from the center of the unit. It also has a stylish silver metal casing that wraps around the compact, square BD-D7000. CES-specific information may be found at www.samsungces2011.com. For more information about Samsung, including press releases, video content and product images, please visit Samsung Newsroom. Samsung Electronics Co., Ltd. is a global leader in semiconductor, telecommunication, digital media and digital convergence technologies with 2009 consolidated sales of US$116.8 billion. Employing approximately 174,000 people in 193 offices across 66 countries, the company consists of eight independently operated business units: Visual Display, Mobile Communications, Telecommunication Systems, Digital Appliances, IT Solutions, Digital Imaging, Semiconductor and LCD. Recognized as one of the fastest growing global brands, Samsung Electronics is a leading producer of digital TVs, memory chips, mobile phones and TFT-LCDs. Samsung is also the HDTV market leader in the U.S. Please visit SAMSUNG for more information. 1 Samsung CY-SWR1100 is a simultaneous dual-N band, 802.11 a/b/g/n-compatible wireless router that ensures superior streaming and content speeds are transmitted to the TV. 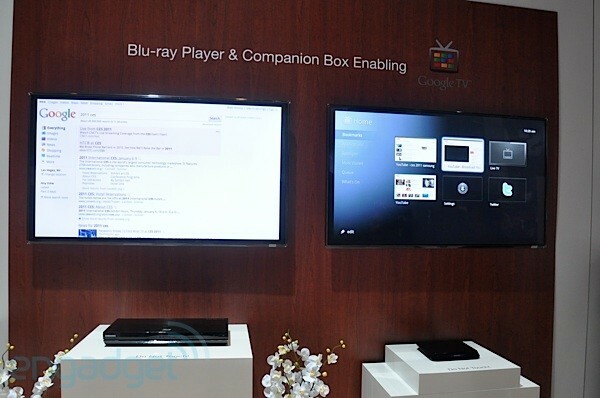 Samsung's unannounced Google TV set-top box, running in its booth at CES. LAS VEGAS--Samsung is showing off two devices running Google TV in its booth here at CES, but employees characterized the unannounced devices as an experiment. Samsung has not officially thrown its support behind Google TV--Google's ambitious but challenged plan for sophisticated TVs--but it was nonetheless showing off both a standalone set-top box and a Blu-Ray player running the software in a corner of its massive booth here at the Las Vegas Convention Center. Executives speaking on background said the devices were being shown as an "experiment," designed to gauge feedback from Samsung partners as to whether or not they'd be interested in such a device. It's a bit tricky for Samsung, which like a lot of other companies has invested a lot of time and money in its own software for putting Internet-capable applications on the big screen. In Samsung's case, that's called Smart TVs, and televisions running its software were displayed much more prominently in its booth than the Google TV devices. Samsung is scheduled to deliver a keynote address later today (live coverage here), and it's not clear whether or not it will announce a deeper commitment to Google TV at that time, or hold back. It said nothing about the devices yesterday in a press conference. In December, The New York Times reported that Google had asked several prospective Google TV partners to hold off on showing new devices at CES, due in part to the lackluster reviews the software has received in its first few months on the market. That report also said that Samsung would be one of the few--if only--major consumer electronics companies showing off Google TV devices at the show. The products themselves, which did not come with price tags or official brands, appear to be Samsung's take on the Logitech Revue set-top box and Sony's Google TV Blu-ray player. But they are clearly not ready for prime time: Samsung had no controllers on display alongside its products, and designing out the control interface for Google TV can be one of the trickiest things about the software. LAS VEGAS Jan 7 (Reuters) - Samsung Electronics Co, the world's biggest TV maker, is in talks with Google to produce a Google-branded Internet TV but it has issues to resolve with the Internet giant, the head of Samsung's television business said. The discussion is part of a string of content and technology tie-ups Samsung is making to get a bigger slice of the emerging "smart" TV market, with an aim of boosting flat-screen TV sales by 15 percent this year. "We are discussing with Google but there are a couple of issues to resolve and we want to make it a win-win deal for both of us," Yoon Boo-keun told reporters without elaborating. His remarks were made in December in Seoul but were embargoed until the Consumer Electronics Show in Las Vegas in January. Samsung announced on Thursday partnerships with Comcast, Adobe and DreamWorks Animation to resuscitate weaker-than-expected sales of 3-D and Internet TVs and fend off margins as severe price competition keeps profits razor-thin. While Samsung has yet to give out any official word on releasing any Google TV devices, the Samsung booth on the show floor at CES is telling the world that theyre heading in that direction. Samsung is currently showing off two yet-unannounced devices running Google TV, and the company is saying that theyre experiments that are made to gauge feedback from their partners concerning their interest. The devices being shown off were a standalone set top box and a Blu-ray player. Although Samsung had a press conference yesterday, they declined announcing these devices, or any other Google TV related devices. Seems Samsung is taking some serious consideration before making any type of move into the GTV market, which is understandable at this point. Hopefully, once CES is over and done, theyll have the feedback they were looking for, and can start into the announcement and manufacturing stages. So, the word is that Samsung was planning on showing off Google TV at its presser, but switched things up at the last minute and stuck to its first party Smart TV offering. Still, that didn't stop two Samsung Google TV boxes from showing up at the show floor, a Blu-ray player and a standalone "companion" box. They both look pretty svelte, and the companion box is particularly smaller than the standalone Logitech and Sony boxes. Samsung's explanation of the showing was the idea that Samsung was "capable" of supporting other platforms, though they didn't have any promises of a release, a release date, or a price range. We also saw a Samsung Galaxy S running the Google TV controller app, which isn't much of a stretch, and there wasn't any sort of physical remote or keyboard on display. Basically, Samsung is showing the bare minimum of a Google TV offering, which seems to be sort of appropriate with Google TV's current feature set, if you want to get all "deeper meaning" about it. During the course of a conversation with reporters in Seoul, B. K. Yoon - the Visual Display President of Samsung, the world's largest maker of flat-screen televisions by shipments - said: "We are still reviewing whether we will make the Google TV set or not." With Samsung clearly banking heavily on Smart TVs to bolster its profits, Yoon said the company's Smart TVs will support Flash as a "must-have for anyone playing web-based content." Meanwhile, besides Yoon, another Samsung executive also mentioned recently that the company was always prepared to join forces with the[FONT=inherit ! important] search engine [/FONT]giant in any areas, where there is a "win-win" situation for both the companies. Samsung has already announced its plans to launch a new Blu-ray player as well as a set-top box that enables Google TV. According to the company, both the devices will enable users to surf the[FONT=inherit ! important] [FONT=inherit ! important]Internet[/FONT][/FONT] on their TV screens, as well as check emails, and build-up social [FONT=inherit ! important][FONT=inherit ! important]networks[/FONT][/FONT] - the functions that are generally associated with [FONT=inherit ! important][FONT=inherit ! important]computers[/FONT][/FONT] and smartphones. roundtable meeting with some of Samsungs top brass along with twenty or so other press members. A lot of questions got asked and we got some great answers. Q: What is your Google TV strategy? What do consumers actually want from their connected TV? John Revie: 60% of 2011 TVs are 3D, 70% are connected and include web-browsing. People want a variety of things, but weve set aside a few key features for consumers so prevent the choice from becoming overwhelming. Google set-top boxes and Blu-ray players are coming, but there are no current plans for a television with Google TV included. Samsung has announced that it will release a new Blu-ray player that can connect with a separate accessory that enables Google TV functionality. The 'companion box' will be sold as a package with a QWERTY keyboard, a necessary component to take advantage of the Internet-based features of Google's software. While several companies are focusing their marketing efforts on Google TV offerings, Samsung has primarily highlighted its "world's thinnest" 3D Blu-ray player and a variety of smart TVs based on its own platform. It remains unclear if the Google TV add-on will be compatible with other Blu-ray players or TVs in the company's lineup. Samsung competitor Vizio recently announced plans to expand Google TV features to a wide range of televisions and Blu-ray players. Both companies have yet to disclose ship dates or pricing details.